As you walk down the aisle, friends and family turn around and gasp in delight. You look so beautiful in your dream dress, your veil sparkles in the magical lights and your smile and happiness exudes. Guests fill the room with love, their eyes stay transfixed, as you are guided to greet your forever love. You both say ‘I do’ as your future is sealed. And you leave blissfully married as husband and wife… for the very first time. Choosing flowers for your wedding ceremony can be one of the most important decisions you’ll make. It sets the mood for the rest of your special day and, of course, it is where you begin the rest of your lives together. 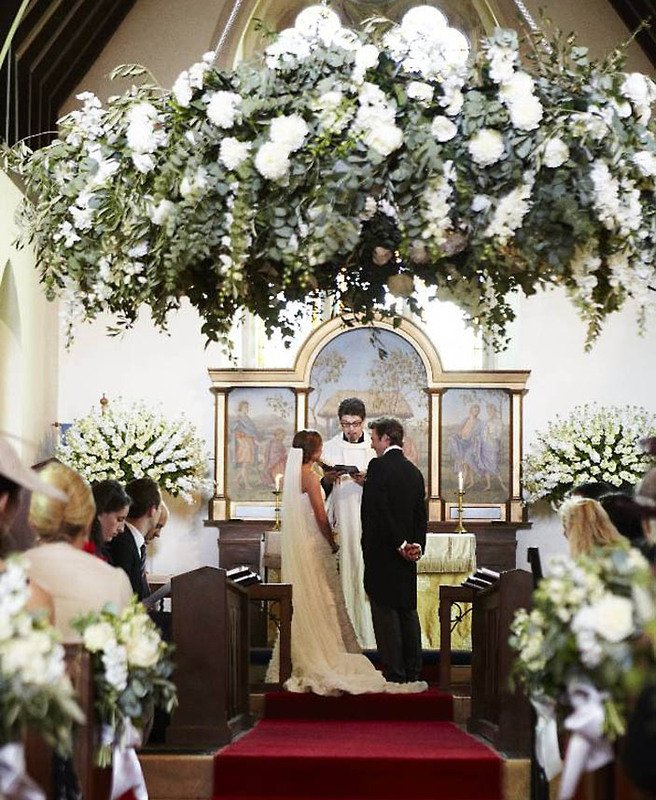 Whether you’re marrying in a quaint church or magnificent ceremony room, you need to choose flowers which complement the surroundings and create perfect harmony all around. For a contemporary and stylish look during the ceremony, keep the colour palette simple using whites, creams and greys. Huge hanging candlelit garlands, wrapped with peonies and sweet peas set a magical feel for this Midsummer Nights Dream wedding. Line the aisle with a wonder of simple white flowers, petals and candles. Stunning large urns on glass plinths create a floating floral fantasy for you and your guests. For a ceremony in a grand space, create arrangements that would work with the scale of the room. For this wedding, I opted for four striking urn arrangements using white and purple hydrangeas, mixed with peonies and stock surrounded by an array of O’Hara, Sweet Avalanche and Secret Garden roses. The aisle was decorated with a walkway of olive trees which were under planted with flowering lavender. Lining the aisle with bouquets of roses draws the eyes of guests down to the two most important seats in the room. Either side of the bride and groom, larger arrangements beautifully border the couple and crystal hurricane lamps surround the room. It’s not just the inside of the ceremony room you need to think about. Make a statement for guests before they even step inside with two magnificent urns either side of the entrance doors. Add a burst of colour with blue delphiniums, purple hydrangeas and pink roses.